Your product has been successfully added to your basket. The original complete recovery product in a large 1.6kg tub. A blend of protein, carbohydrate, electrolytes & minerals. Strawberry flavoured recovery drink powder in a 1.6kg tub, ideal for regular use. 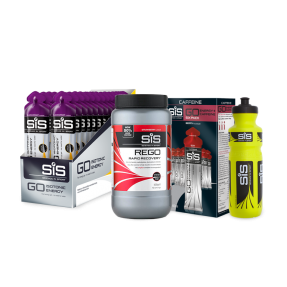 SiS REGO Rapid Recovery is a complete recovery product to be consumed immediately after exercise. It contains a blend of carbohydrate (23g), protein (20g) and electrolytes with vitamins and minerals. Rapid replenishment of your glycogen stores and the provision of protein helps you to get the most from your training and prepare you for your next session. Suitable for: Vegetarians; Coeliacs; Gluten Free; Wheat Free; Nut Free. Contains Soy. GO TO HELL AND BACK. THEN GO BACK FOR MORE. Carbohydrate is your body's main fuel for moderate to high intensity exercise. During training and competition, our bodies can absorb around 60g of carbohydrate per hour, meaning that demand will outstrip the supply of energy. This shortfall is met by using your glycogen stores, which must be replenished post exercise so you are able to perform well in your next session. REGO Rapid Recovery contains high quality protein with a complete amino acid profile enhanced by the addition of 2g of Leucine. A vitamin and mineral profile has also been included to support the recovery process by contributing to normal muscle function and protein synthesis. When should I have this? 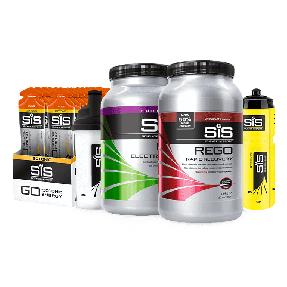 SiS REGO Rapid Recovery should be consumed within 30 minutes of stopping exercising after short, intense sessions and prolonged endurance sessions. What is the difference between REGO and Whey Protein? 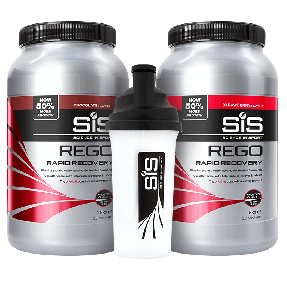 Use SiS REGO Rapid Recovery when the aim is to replenish carbohydrate energy stores and take on protein for rebuild, Whey Protein contains a lower level of carbohydrate. Do I mix with water or milk? Although milk is high in protein, milk is made up of 80% casein, which is slow digesting. Mix with water to increase absorption rates and aid hydration levels. What type of protein does this contain? SiS REGO Rapid Recovery contains soy protein isolate, which is made from the de-fatted beans leaving a high quality protein source and a full amino acid profile. Why isn't it suitable for vegans? SiS REGO Rapid Recovery contains vitamin D, which is derived from animal sources. How much protein is there per serving? 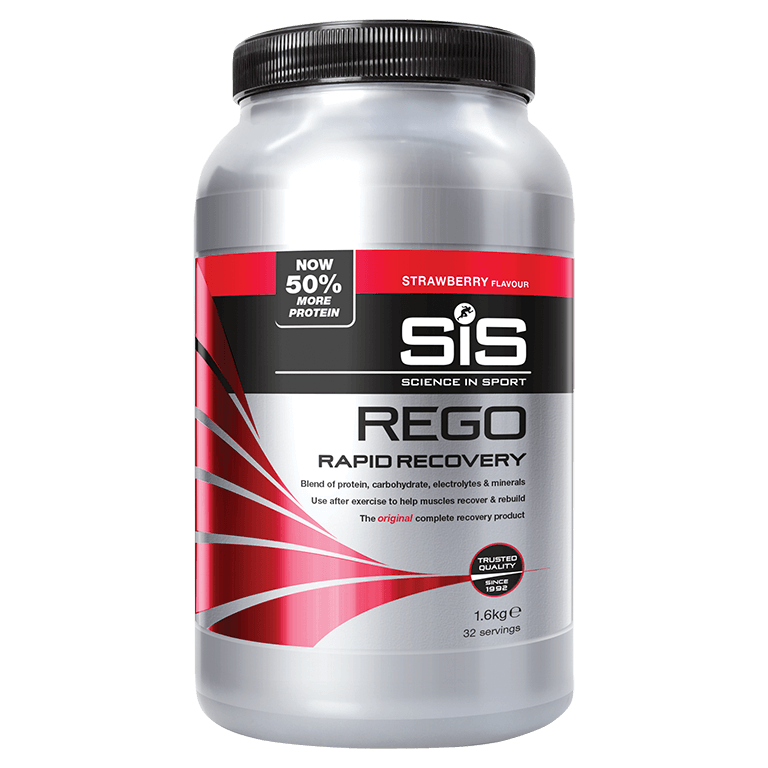 SiS REGO Rapid Recovery contains 20g of protein. Add 50g (approximately 3 scoops) to 500ml of water and mix well. Objectivement, le goût du produit n'est pas désagréable. Sa dilution est très bonne et la quantité est confortable. Niveau performance, je n'ai eu aucun désagrément depuis que je l'utilise et je trouve qu'il aide vraiment à la récupération. Seul bémol, la dosette intégrée n'est pas très pratique. En effet, la quantité conseillée pour un shaker est une dose de produit de 50mL pour 500mL d'eau. Et la dosette fournie a une contenance de 35mL. big pot , will last for the winterseason. Mixes well, tastes good and seems to be effective at limiting soreness and fatigue after a long ride, run or gym session. Tasty and easy to mix. .
great product but container is consistently only 3/4 full. Good taste, perfect combination of carbs and proteins for recovery. After using this, I am always ready for new adventures. I have been using REGO for a number of years and I have found it to be very effective and reasonable priced. Good flavour though personally I would avoid the chocolate flavour as too rich for me.. Strawberry one though awesome.